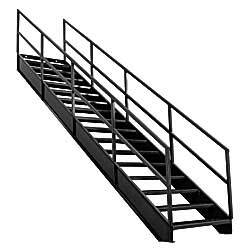 Designed to provide durable, reliable access to mezzanines, platforms, etc, all-welded stairways arrive set-up and ready to use. 36"W rugged units feature 10" channel stringers for extra rigidity. 1-1/2" tube hand rails are welded 32" above the stairs. Steps feature heavy Grip-Strut®tread for slip-resistant footing. OSHA compliant. BOCA-compliant stairways available, call for information. Gray painted enamel finish. FOB WISCONSIN. XP-1170 35" x 48"	 223	 5	 42"
XP-1171 42" x 57"	 260	 6	 49"
XP-1172 49" x 67"	 309	 7	 56"
XP-1173 56" x 76"	 346	 8	 63"
XP-1174 63" x 86"	 382	 9	 70"
XP-1175 70" x 95"	 419	 10	 77"
XP-1176 77" x 105"	 468	 11	 84"
XP-1177 84" x 114"	 505	 12	 91"
XP-1178 91" x 124"	 541	 13	 98"
XP-1179 98" x 133"	 577	 14	 105"
XP-1180 105" x 143"	 626	 15	 112"
XP-1181 112" x 152"	 663	 16	 119"